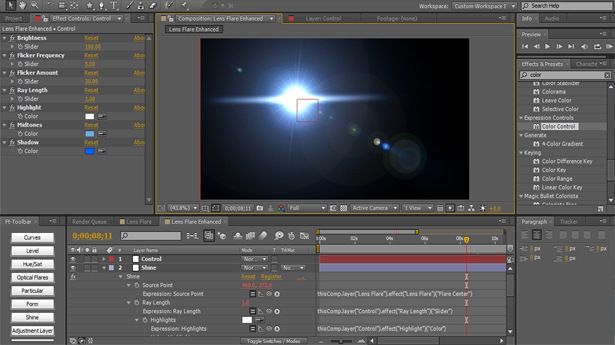 The default Lens Flare effect in After Effects looks hideous, outdated, and very basic. Today, we’re going to be taking a look at how we can breathe some life back into the default Lens Flare and how we can enhance it by adding more to it. This tutorial is an addon to Harry Frank‘s tutorial, ‘Reviving AE Lens Flares‘ so many thanks to him as some of the techniques were brought over from his tutorial. We will be adding on to this tutorial by adding additional controls to a null object such as brightness, flicker frequency, flicker amount, and ray length to easily manage and control your lens flare with a simple layer. In this tutorial, we will also be using quite a bit of basic expressions and parenting so if you’re uncomfortable with After Effects expressions, this tutorial will give you a brief explanation on them, allowing you to get your feet a little wet in the expression world. Remember, don’t forget to tweak, tweak, and tweak as this is just the basic elements of a lens flare. Add more elements and color correct to give your lens flare more pop and complexity. Why even go through all this for a simple lens flare when you have Knoll Light Factory or Optical Flares? For fun and other financial reasons. Andrew Kramer from VideoCopilot actually did a post awhile back on tweaking the default AE Lens Flare and although it wasn’t that in-depth, he provided a nice anamorphic lens flare project file for download that actually looks very nice. Definitely check it out. If you’re wondering about how you could add 3D functionality to the default Lens Flare, check out this post on conversion using expressions. If you liked my tutorial or have any questions or feedback, leave your comments down below, it would really show some support! very cool, thanks! sparks many ideas! I know it has been some years, but I had a question. For some reason, my expression for the brightness stops working when I add the expressions for flicker. Have I done it wrong? Or is this something that is negated in the newer version of after effects?